For many, a new year has started. The need to dust off our tranquil state of mind and focus on things far more cerebral than who has more distinguishable tan lines – has arrived. It’s back to school time! Time to rev up those synapses and dendrites. 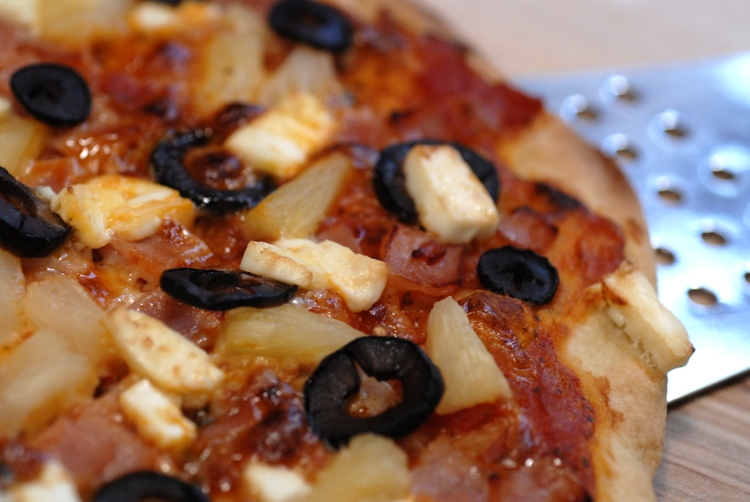 If you’ve never thought of PIZZA as brain food, it’s really a simple adjustment of the toppings. Slap those ingredients that are heavy on the Omega-3’s and you’ve got pizza brain food (proof!). Having spent far too many years in school (mostly remedial no doubt) I will top mine with salty, meaty, fatty, anti-brain-enhancing deliciousness. 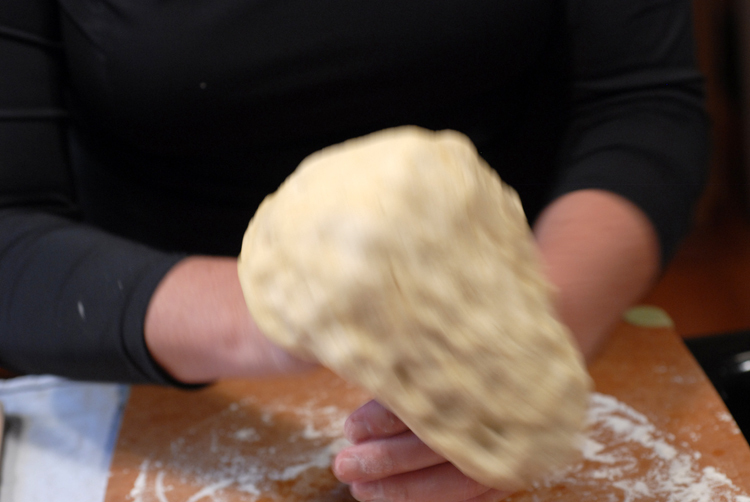 The dough is made using a stand mixer so it comes together relatively quickly. With your warm tap water running, place an instant read thermometer under the flow. When you have dialed in the temperature within the degrees mentioned above, rinse a measuring cup a few times to reach that temperature then fill the measuring cup to 1/2 cup. Add the yeast, sugar and salt stirring to combine. Let this rest for about 5 minutes. The yeast should foam, if not consider buying new yeast. Place the flour and oil in the bowl of the mixer. Add the yeast mixture and stir on medium speed for about 7 minutes; wait until all the dough has collected together. Grease a large, clean container lightly with olive oil. Pat the dough into a ball and place it in the greased container making sure the dough is coated on all sides with the oil. Cover the container with plastic wrap or lid. Let the dough rise for 2 hours in a warm place. 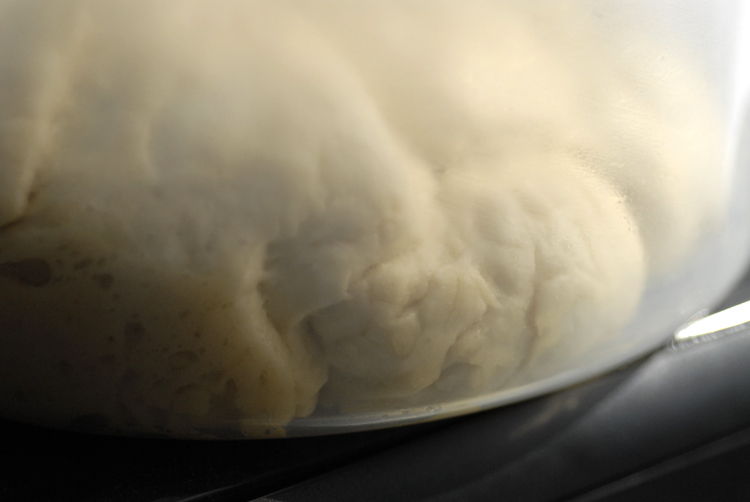 Once the dough has risen, pat it into a ball and place back into the container for another 20 minutes at room temperature. 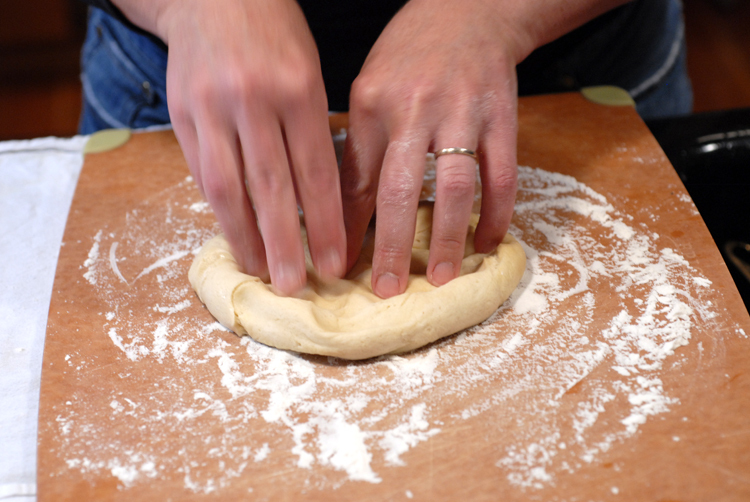 On a flour dusted cutting board begin dimpling, stretching, and tossing into a thin disc. Preheat oven with pizza stone to 450°. Flour a pizza peel lightly. 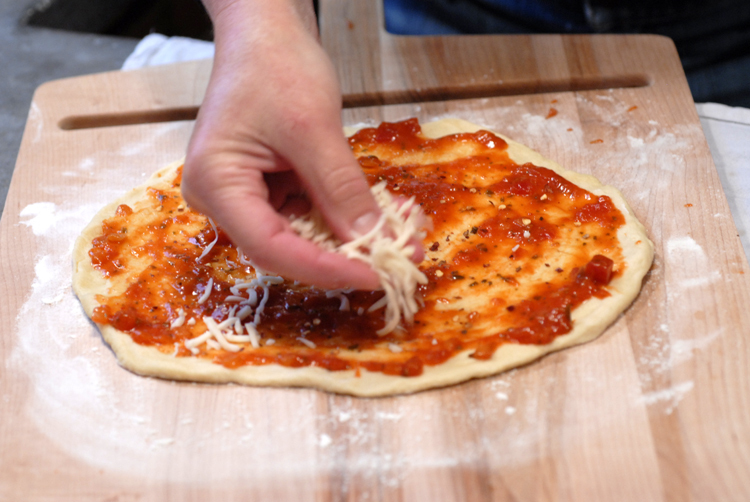 Place the formed dough on the peel and add sauce and toppings. 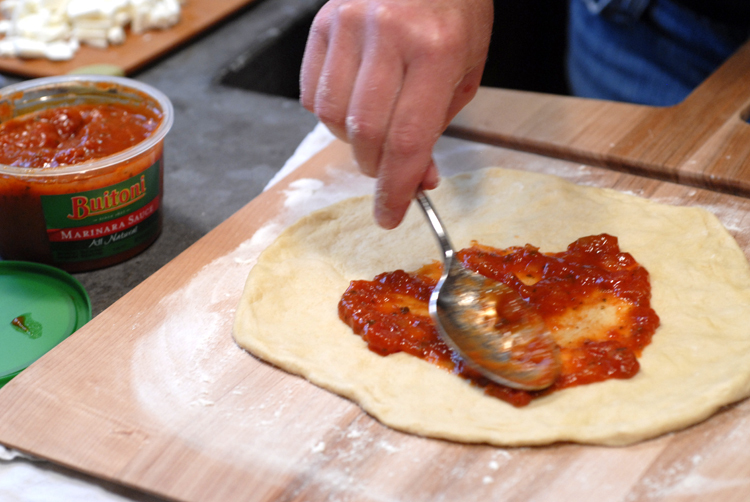 Give your peel a little wiggle to make sure the pizza will easily slide onto the pizza stone. 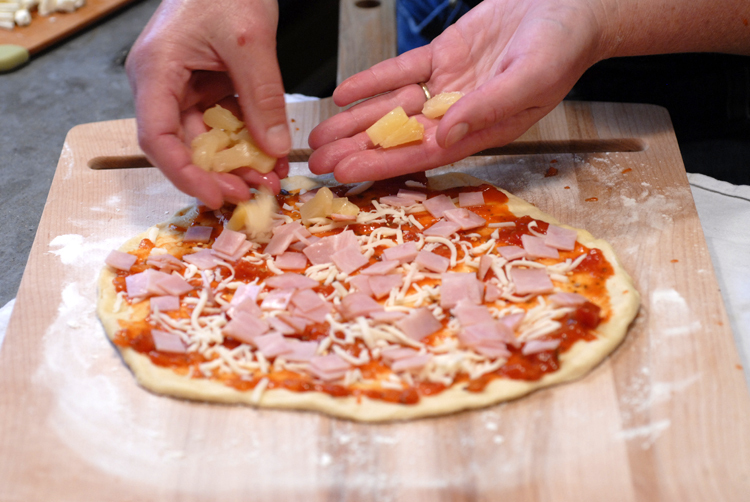 If there’s lack of movement, try to loosen the pizza with a spatula and shake the peel again. 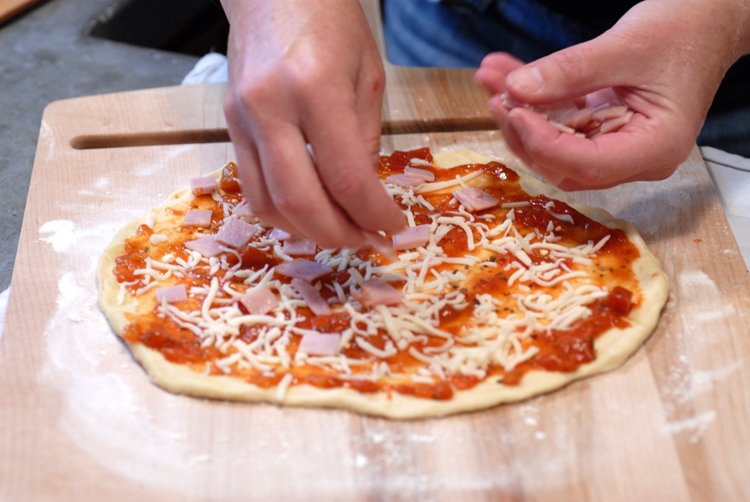 If it’s really stuck gently remove the pizza back onto the floured cutting board and add more flour to the peel. 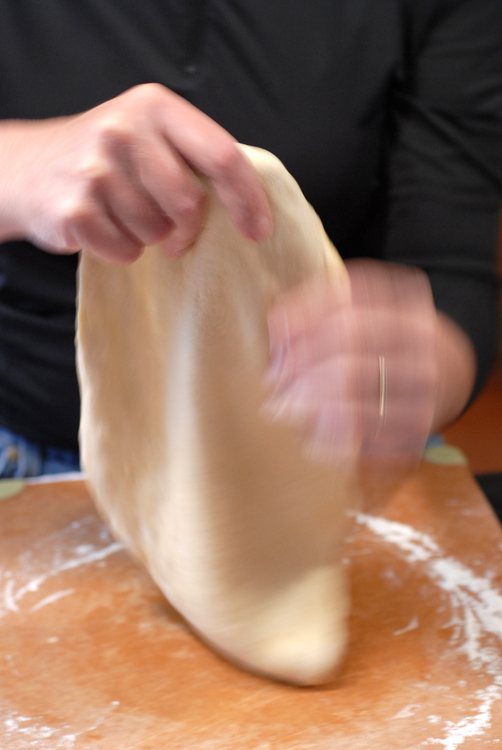 Transfer the pizza back to the peel and give it a wiggle. 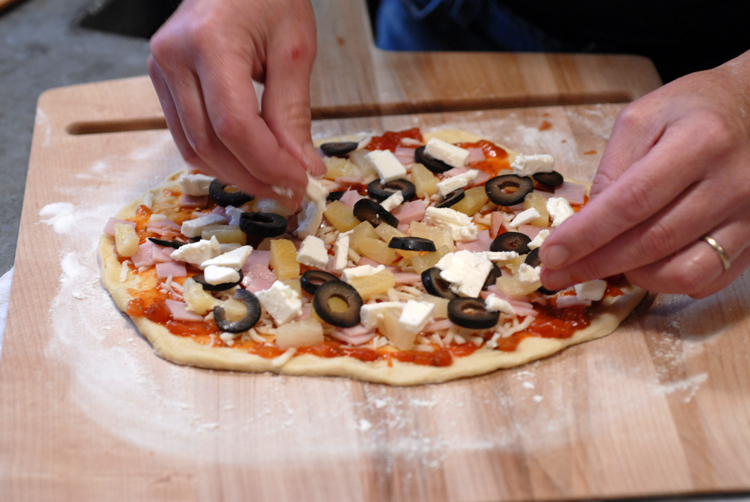 Carefully slide the pizza from the peel onto the preheated pizza stone. 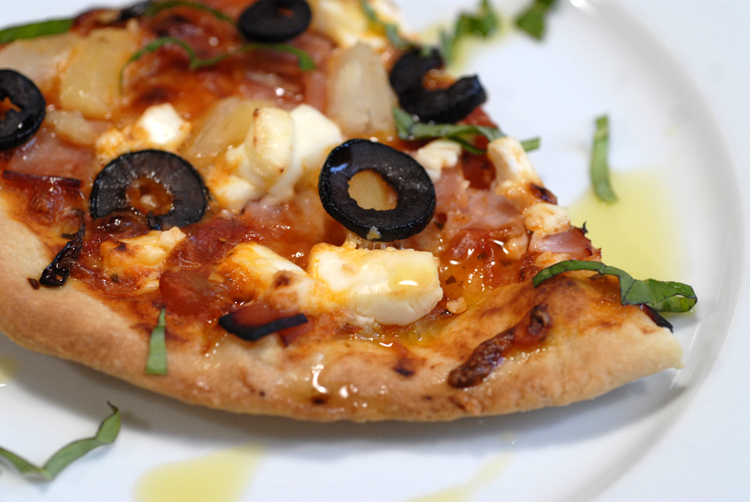 Bake pizza until browned, about 14-16 minutes. 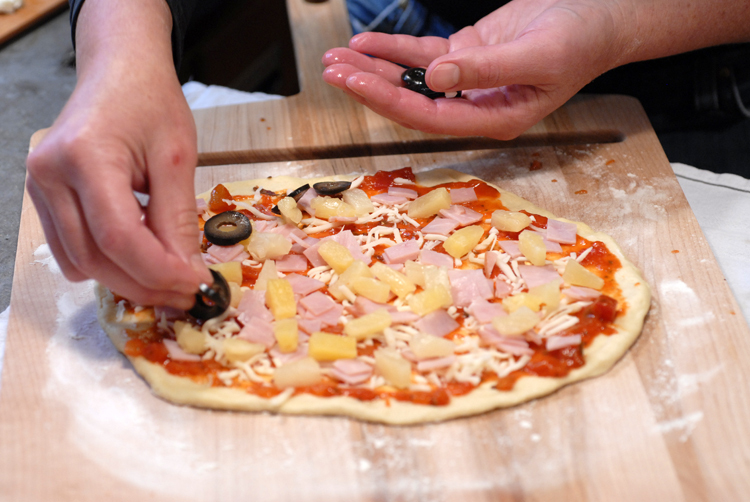 Remove from oven and place on cutting board. Cut into pieces and drizzle with olive oil and basil. This entry was posted in entree, recipes, sides and tagged pizza by MixedSoup. Bookmark the permalink.